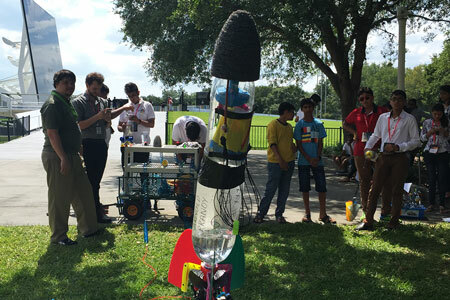 SpaceTrek is an educational company located at the Kennedy Space Center Visitor Complex where students from all around the world can come to experience hands on STEM programs and learn about space exploration. We are dedicated to keeping ahead of the curve in STEM educational experiences and there is an enormous amount of work to make this happen. The most important element to our success has been our staff. Between our highly industrially experienced board of directors and our savvy, dedicated, and even comedic instructors we are able to stay flexible and produce experiences many others simply cannot for one reason or another. As a team we strive to give opportunities to grow and create memories for life as we teach kids and adults about particular facets of the STEM field, space exploration, and the role of NASA. Our hands on programs allow people to look away from the textbook and enjoy the practical side of their growing knowledge. It is well understood that the most successful industries, especially NASA, rely on being able to work together to meet their goals. With this idea in mind we believe it is important to give kids the confidence to step away from the typical solo classwork in order to experience a collaborative effort where succeeding with teamwork is not only the focus but a necessity. Being at the Kennedy Space Center Visitor Complex has allowed us to combine the aforementioned ideas to design multi-day programs that allow a unique way for people to have fun with all of what the Kennedy Space Center has to offer and learn simultaneously.